I woke up early this morning for some odd reason -- I was awake at 6:00 a.m. I am so glad because I wouldn't want to have missed one single second of this gorgeous day. I had already trimmed my rosebushes in the front yard by 7:00 a.m. and was at one of the local farmer's market a little after 8:00. Hubby had a board meeting to attend today from 10-2:30 (seriously...WHO schedules board meetings on Saturday's??? )...so after the farmer's market I headed to Publix and did a little bit of grocery shopping and was still back home before 10:00. For lunch I made myself a veggie burger that I grilled on my panini pan (you can use it as a grill pan too). It only takes a few minutes on each side. I put it on one of those Arnold whole wheat sandwich thins (the really skinny buns) and topped it with some cheddar and a few slices of a tomato just picked from my tomato plant. I put a handful of reduced fat chips on the plate and decided to dine alfresco since it was such a gorgeous day. Check out my lunch below -- it was really good. 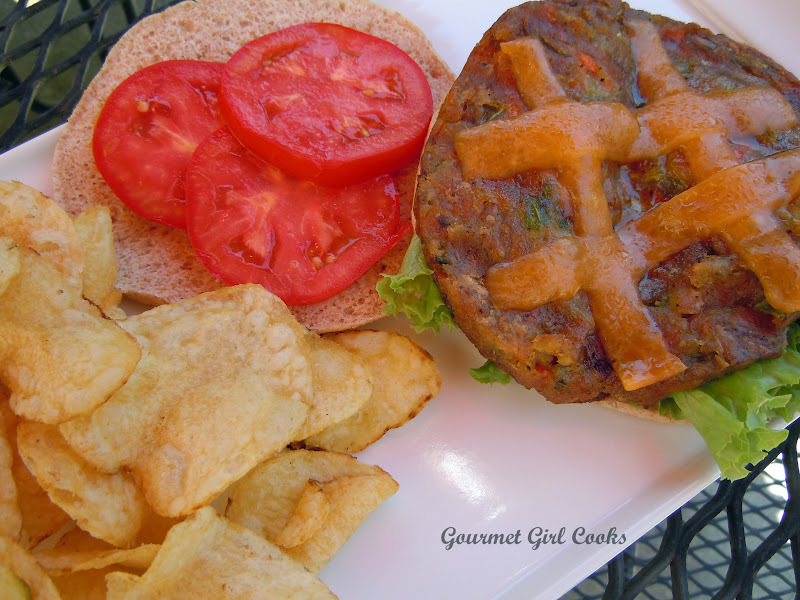 Not sure hubby would like these "burgers" though...they are made of carrots, celery, bell pepper, garbanzo beans, brown rice flour and sunflower seeds...but I enjoyed it! 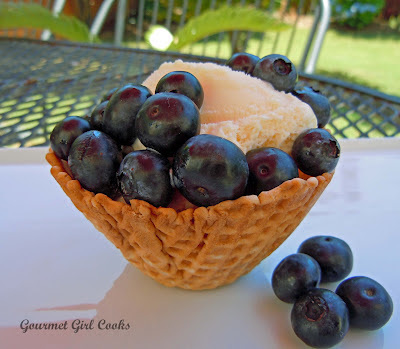 Since I picked up some beautiful blueberries while shopping this morning, I decided to have a scoop of frozen vanilla lowfat yogurt topped with some fresh blueberries. 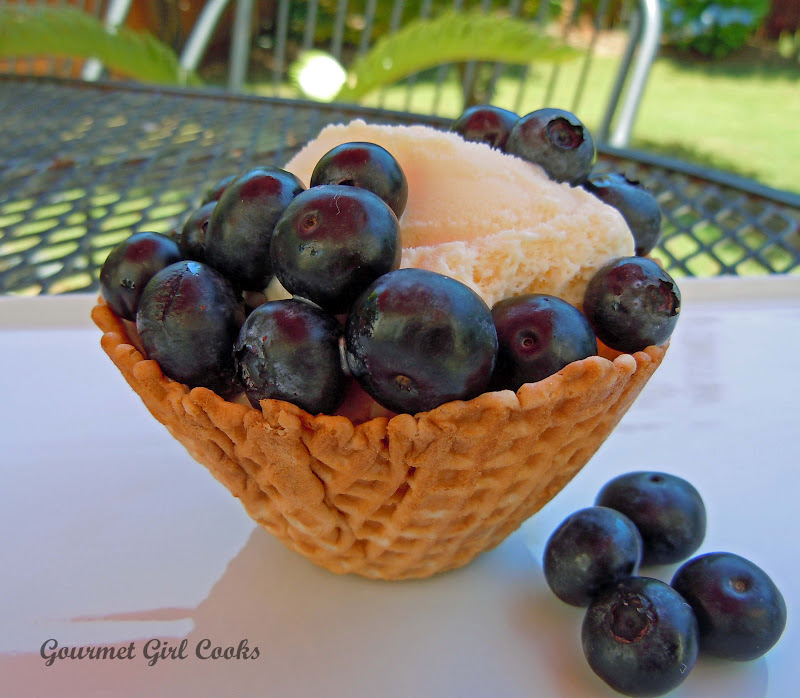 I served it in a little waffle bowl...and enjoyed dining in the "secret garden". I hope tomorrow is just as gorgeous as today is. This is MY kind of weekend!